I have a love of old, worn, pretty things. I like to think about where these things might have come from and the people that had these items. We have a room in our house called "The Pretty Room" it's really for us girls. The boys have their man-cave that reflects their love of baseball, and we have The Pretty Room. This week while I'm working on a new sewing project, and before I can show it to you, I thought I'd show you some fun things in this room. One of my favorite things is the verse on the beam it is Isaiah 40:8, "The grass withers and the flowers fade but the Word of our God stands forever." When I am in there, it reminds me of what's important in life. 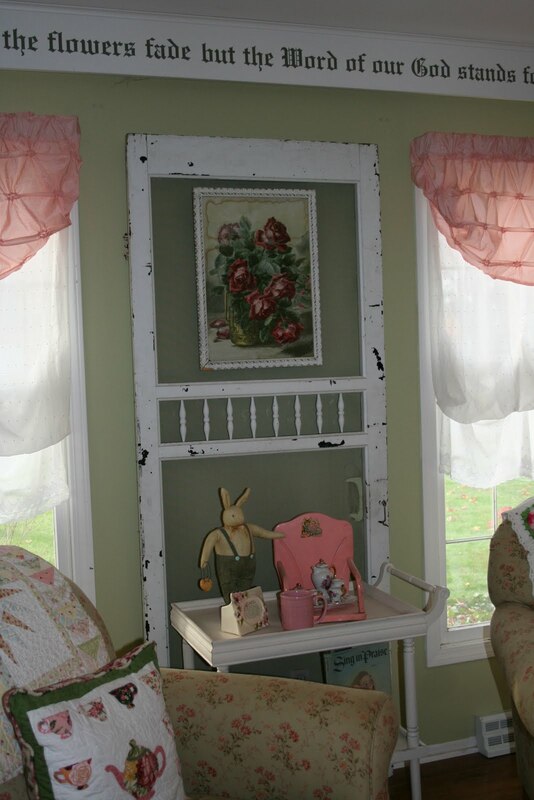 I love old screen doors. I wish we would still use them. We had a metal screen door when I was growing up. I can remember summers and the sound that door made when my brothers ran in and out to play. I like the sound the door made, a happy sound announcing the arrival of someone. I daydream about this screen door. Was it on a farm house? Or an old victorian with a wrap-around porch? Wherever it stood, I hope it made that happy sound for someone. I hope too, that they enjoyed Isaiah 40:8 as much as I do. I found your blog through Dawn's blog. . . & I just wanted to stop & welcome you to blogging! I'll be adding you to my blogroll - if you don't mind!. . . & I'm looking to your posts! Thank you for your encouraging words. Your blog is one I go to everyday! I recently ordered your Celebration fabric from Shabby Fabrics, before I saw your sale. I just love the patterns and colors you chose. How fun to design your own line! I hope we can see pics of your studio in transformation. I would feel blessed to be on your blogroll. Have a blessed day! I just wanted to leave a little comment and share my love for the Pretty Room. This room is by far my all time favorite room to ever exist! From all of our girl talks to our awesome bible studies that took place in here, it's just filled with love! :) You did a wonderful job creating that room, as you did this blog! I enjoy reading everything! hehe, I bet you never knew that, did you?